Multi-party elections and the signing of a Nationwide Ceasefire Agreement (NCA) in 2015 raised hopes in the international community of a possible settlement of Myanmar’s protracted conflict and one of the world’s worst protracted displacement situations (PDS) in the near future. Yet conflicts in the border areas and human rights abuses carry on, more than 600,000 Burmese continue to be displaced within Myanmar and three to five million remain in Thailand. 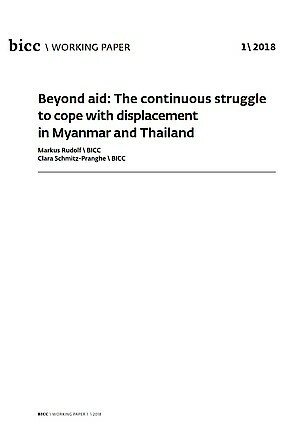 This Working Paper examines strategies that displaced persons from Myanmar have developed striving to cope with major challenges of displacement. The authors observed that strategies go beyond the commonly used three durable solutions. The findings suggest that neither return nor local integration into the society of the host country is necessarily definite or are mutually exclusive. Both are merely two poles of a wide range of displaced persons’ possible coping strategies, encompassing return, cyclical movements, temporary return, de jure local integration and different levels and stages of de facto local integration. In scrutinizing whether the change of governance eradicated the causes of displacement, brought peace and laid the foundation for return, research revealed significant flaws in Myanmar’s political transition. Notwithstanding impressive achievements, conflicts persist and are likely to cause new waves of displacement. With regard to access to legal, economic, political rights, services, house, land, property and livelihoods, the situation of displaced persons (DPs) remains dire. Still, the international community promotes return and has been reducing assistance for camps in and outside of Myanmar. For internally displaced persons (IDPs) and refugees, this means that options of refuge have diminished, while the causes to flee remain. After decades of displacement, DPs have developed a set of practices such as diversifications of livelihoods, in- come sources, residences, and others. The authors argue that it is imperative for any long-term and coherent strategy that addresses protracted displacement to take those micro realities into account.